The family took a trip over to Old Salem this past Friday. The town was founded in 1776 by Moravians. The buildings have been preserved and costumed staff lead tours and hands-on activities from the 1700s and 1800s. 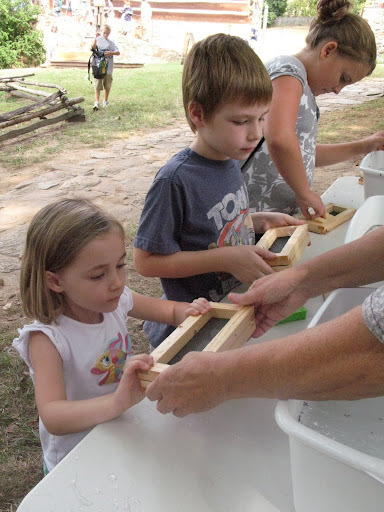 Friday was a homeschool day with lots of fun activities. We had an amazing time. I have been to a lot of historical attractions, but this was quite possibly the best I have ever visited. I was so inspired by the village. I love the simplicity of the building and the trades of the inhabitants. I know I can't do the experience justice here on the blog, but I wanted to share a few photos of our day. I fell in love with these water buckets. These particular ones were in the home for unmarried men. We also saw some in the tavern, but they were unlabeled. I told Michael I was going to get buckets for each of us in the family. 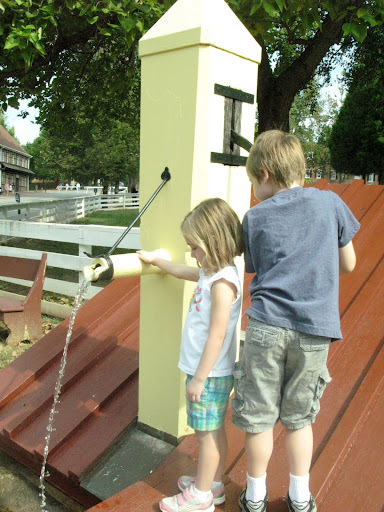 Especially since the kids loved pumping water. We couldn't keep them away from the pumps! It was a great day and I look forward to going back for the Christmas Candlelight tour. Actually there are a lot of events that look worthy of a return visit. Their classes look pretty great, too. If you live near the area, I highly recommend a visit! I grew up in Winston-Salem and went to old Salem often! One of our family traditions is to go to the Moravian Love Feast around Christmas time. We also always have Moravian sugar cake for Christmas morning breakfast (put pats of butter on top and warm up in the oven-- so good!) and have the sugar cookies around the holidays too! Such a cool place to check out. They also have an amazing Easter morning sunrise service with a brass quartet that plays as the sun is rising- gorgeous! So glad you're having fun exploring NC! looks like it was well worth the visit! glad you had such a good time. i love that pic of the buckets. old salem looks really neat - i wish we had such places here in california; you don't quite get the same sense of american history over here (although i'm sure many would argue otherwise). what a perfect field trip! I love old architecture! What fun!